CELLARIUS -Haemisphaeria sphaerarum rectae et oblique utriusque motus..
CELLARIUS,A. - Haemisphaeria sphaerarum rectae et oblique utriusque motus..
Haemisphaeria sphaerarum rectae et oblique utriusque motus.. - CELLARIUS,A. Size : 16.9 x 19.9 inches. / 43.0 x 50.6 cm. Description :A celestial chart depicting the location of the planets and stars according to ecliptic co-ordination and celestial-equator co-ordination. Two planispheres in lower corners show the positions of two stars according to both systems. 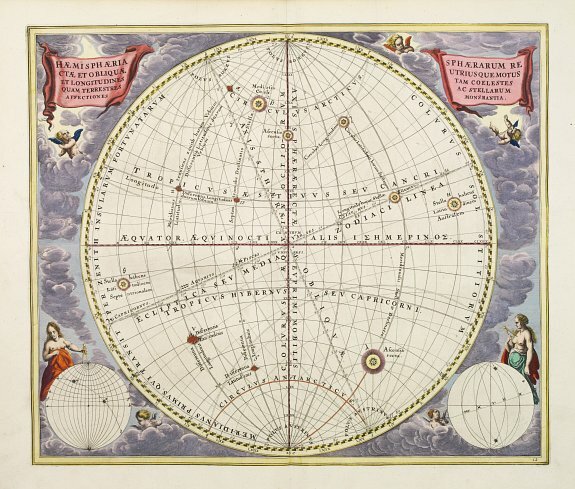 From: Atlas Coelestis seu Harmonia Macrocosmica.